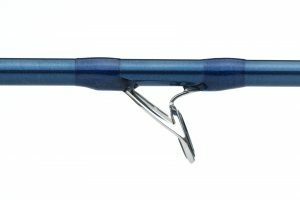 The salarius series is a series of three rods that are completely fitted with salt water resistant components, as they are designed and developed for Scandinavian salt water fishing. 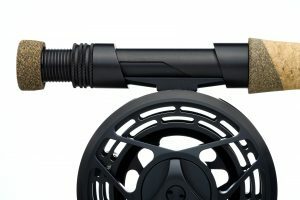 That being said, this rod series is of course perfect for fresh water fly fishing as well. All the blanks in this series are made of graphene, a carbon composite that is truly revolutionary. Graphene is a new material that has the potential to alter the future.It has repeatedly earned the title “wonder material” due to its various properties and almost limitless number of applications, including being utilized in the production of fly fishing rods now. It is incredibly strong – between 100-300 times stronger than steel. The main reason we are using graphene for the salarius series, is that it strengthens the blanks far more than average carbon does, and the recovery of the blank is about 15% faster as well. The tests we have done over the last few years have proven to us that it is easier to load a rod made of graphene, and also easier to control the line in the cast. Building the blanks out of graphene actually also adds a lot of reserved power, which requires minimal extra effort to achieve. 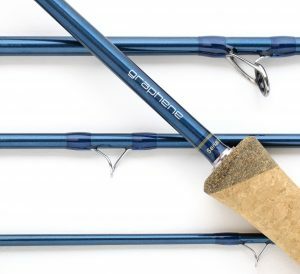 The rods in this graphene series all have full wells grip because the shape of this handle is unique – also among lightweight rods. The shape of the handle ensures both precision and distance, which are the keys to success fly fishing anywhere. Furthermore, the handle is incorporated with our own signature up-locking anodized aluminium reel seat. All three rod sizes arefitted with chrome “Japanese Fuji K” tangle-free and ultra-light shooting guides. These guides are just the best on the market for fly fishing, and an outstanding improvement when it comes to shooting lines. The individual sections of the rod are neatly arranged in a sectional cloth bag. The flap of the soft cloth bag is equipped with a microfiber cloth for cleaning your rod’s connection points before assembly or storage. The rods in the salarius series will be delivered in a black aluminium 2GO case – a new and cool design that is exclusive to salmologic. It is designed so that the rods can be accessed from either end. This travel case also accommodates not just one, but two rods at once, making it ideal for the traveling fly fisherman.